Basic foundation practices in Vajrayana Buddhism (and many other forms of Mahayana) include making offerings and prostrations to the Three Jewels — Buddha, Dharma and Sangha, and, in some practices, Gurus, Yidams and Dakinis. Yongchap practice, offering seven water bowls, is one of the most basic daily practices. Eight bowls is often offered as well. Offerings in general, are an antidote to greed and attachment, and can include charity, donations, and shrine offerings. Charity and selfless actions, a dedication to the welfare of others, help us release selfish attachment and is a bodhichitta practice. Offering to the Buddhas and Gurus first — usually in the morning before we eat — demonstrates our selfless dedication to our Bodhisattva vows and our teachers and deities. Water Bowl Offerings is a foundation basic practice in Vajrayana Buddhism that teaches us generosity, helping us overcome stinginess. Seven bowls are filled with water each morning, and offered to the Buddhas. With my body, speech, and mind, humbly I prostrate. I make offerings both set out and imagined. I declare every unwholesome action I have ever committed. I rejoice in the virtues of all beings. And please turn the Wheel of Dharma for us. I dedicate all these virtues to the great Enlightenment. In some religious practices the words offering and sacrifice are synonymous. In Buddhism an offering is for the benefit of the practitioner and all beings, not for the benefit of the Buddha or Enlightened Being. Buddhas and enlightened beings do not require sacrifices. Offerings should be obtainable without any difficulty. In fact, it is important that what we offer does not take away from others. If one wishes to offer precious gems, gold, money we don’t have, or even just fine foods — but we have to borrow, steal, or lie to obtain them — this runs counter to the principles of Buddhist offerings. For this reason, water, the most plentiful substance in most areas, is the chosen offering. It is pure, clean, plentiful — not requiring us to hurt others to give it — and it is symbolic of purity. The best offering is to offer our practice — to offer just ourselves and our prayers, thoughts and meritorious actions. In addition, many of us offer up beautiful flowers, incense, even the sun and the moon through visualized offerings. The eight sensory offerings from left to right are: water for drinking, water for washing (the feet), flowers for beauty, incense for smell, light (candles, buttlerlamps or light) for seeing, perfumes, food for eating, and sound or music for listening. Sound and Music (Shabda): in eight bowl offerings, the eighth bowl represents sound. In seven bowl practice, it is said there is not eighth bowl for sound because sound is non-visual. 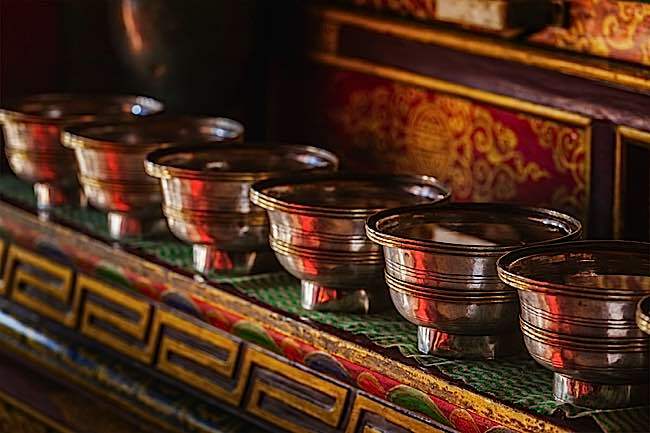 Offerings (Tibetan Water Offering Bowls) in Lamayuru gompa (Tibetan Buddhist monastery). Ladadkh, India. Other practices emphasize just seven bowls of water, representing the absolute purity of the Buddhas. Buddhas and enlightened deities obviously do not need the offerings, whether food, incense or water. The act of offering is for our own benefit, to show we think of our Bodhisattva vows first, that we wish to overcome attachments to these very things we offer. Water, without which there can be no life, is symbolic of our attachments and greed. A bell placed in the eighth bowl (sound) if an eighth bowl is used. 1. Seven clean bowls of any pleasing material, usually copper, brass or silver, but many use porcelain or glass. 2. Fill a jug with clean water, usually mentally purifying the water as it is poured, often chanting the seed syllables of Buddhas body, speech and mind: OM AH HUM. 3. Do not place an empty bowl on the shrine. Clear a space lower than the objects of veneration, which might include statues of Buddhas and Bodhisattvas (body of Buddha), Sutras (Speech of Buddha) or Stupas (Mind of Buddha). Fill the bowls one by one before placing on the altar. 4. Place from left to right, with only the space of one grain between each bowl. Continue chanting OM AH HUM or other purifying mantras and mentally visualize the water being purified or transformed into its essential nature of emptiness. Typically, mantras such as Om Mani Padme Hum, Om Muni Muni Maha Munaye Svaha or Om Tare Tuttare Ture Svaha would be chanted. 5. Make a dedication when all the bowls are filled. OM SHABDA AH HUM (Try to hear or imagine beautiful celestial music, singing bowls, bowls, drums). The dedication is actually very important. A mechanically place offering, without virtuous intention or a dedication — even if the offerings were priceless jewels — would have no benefit. We try to genuinely dedicate the merit of the offerings to the elimination of suffering and its causes for all beings and to their cause for enlightenment. I declare every unwholesome action I have ever committed. I rejoice in the virtues of all beings. I dedicate all these virtues to the eradication of suffering and to the great Enlightenment. 2. Dry each bowl and place face down on the shrine or put them away. The water is empty and can be disposed of, but some people share the offerings with houseplants or the earth. This is a beautiful thing of which I was unaware till now. Thank you so much for showing it to me. Very interesting and very lovely. This daily practice truly is the best way to start a day. It is humbling and enlightening to make offerings to the great enlightened ones. Thank you for asking. It’s a powerful practice. 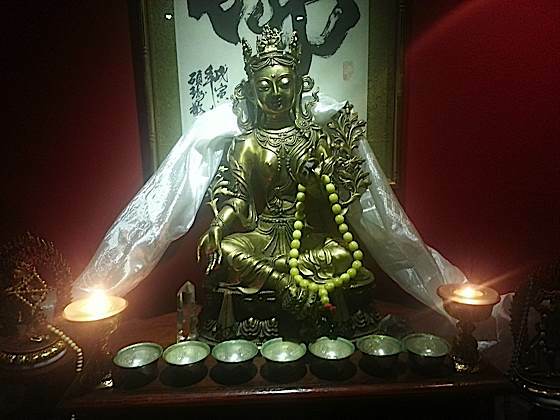 I try to do nine sets of eight water bowl offerings each day as a foundational practice. It’s very peaceful, a very powerful form of meditation, and it’s meritorious. 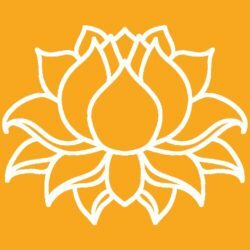 Thanks for your sharing and it inspires me how to encourage others to practice Buddhism.